Patrick James Rothfuss (born June 6, 1973) is an American writer of epic fantasy. He is best known for his series The Kingkiller Chronicle, which won him several awards, including the 2007 Quill Award for his debut novel, The Name of the Wind. Its sequel, The Wise Man's Fear, topped The New York Times Best Seller list. Patrick Rothfuss was born in Madison, Wisconsin, and received his B.A. in English from the University of Wisconsin–Stevens Point in 1999. He contributed to The Pointer, the campus paper, and produced a widely circulated parody warning about the Goodtimes Virus. He received an M.A. at Washington State University, and returned to teach at Stevens Point. In 2002, he won the Writers of the Future 2002 Second Quarter competition with "The Road to Levenshir," an excerpt from his then-unpublished novel The Wise Man's Fear. In 2006, Rothfuss sold his novel The Name of the Wind to DAW Books, which was released in 2007. It won a Quill Award (for Science Fiction, Fantasy and Horror) and was listed among Publishers Weekly's "Books of the Year." It also won an Alex Award in 2008. Its sequel, The Wise Man's Fear, was published in March 2011 and reached No. 1 on the New York Times Hardback Fiction Best Seller List. The Slow Regard of Silent Things was published in October 2014 as a companion tale for The Kingkiller Chronicle, featuring character Auri. Rothfuss has also released two novella-length stories set in the same world as The Kingkiller Chronicle in anthologies. The first was "How Old Holly Came To Be," published in Unfettered in June 2013. The second was The Lightning Tree, released in Rogues in June 2014, featuring character Bast. The whole anthology was nominated for the 2015 World Fantasy Award for Best Anthology. Rothfuss organizes the charity Worldbuilders, which, since 2008, has raised over $7.4 million, primarily for Heifer International, a charity that provides livestock, clean water, education, and training for communities in the developing world. At the end-of-year fundraiser for 2017 Worldbuilders raised $1,225,357 for Heifer International. In August 2012, Rothfuss began a monthly podcast called The Story Board on fantasy, featuring authors such as Terry Brooks and Brandon Sanderson. The Story Board ran for eight episodes. In June 2015, he and Max Temkin started a podcast called Unattended Consequences, then named Untitled Patrick Rothfuss. In 2014, Rothfuss began collaborating with James Ernest to create an abstract strategy game called Tak based on the game featured in his book The Wise Man's Fear. 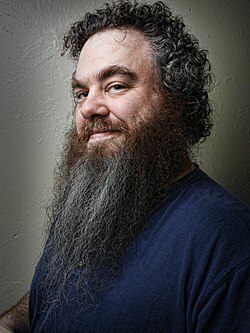 Rothfuss has played a character named Viari in the Penny Arcade's live Dungeons & Dragons games known as Acquisitions Inc. from Season 7 onward, as well as a guest role in its spin-off show "The 'C' Team". He also role-played as guest character Kerrek in Geek and Sundry's show Critical Role episode 56, "Hope," and again in episodes 81–84. He also recorded a letter his character wrote which was heard in episode 69, "Passed Through Fire". Rothfuss was a guest on Wil Wheaton's Tabletop, playing Lords of Waterdeep on Episode 10 of Season 2, which he won. He was a member of the Story Design team for inXile's Torment: Tides of Numenera game. Rothfuss has two sons and lives in a house he bought with his girlfriend, Sarah. The Adventures of the Princess and Mr. Whiffle Part I: The Thing Beneath the Bed (July 2010, Subterranean Press). The Adventures of the Princess and Mr. Whiffle Part II: The Dark of Deep Below (2013, Subterranean Press). Your Annotated, Illustrated College Survival Guide (January 2005, Cornerstone Press). Rick and Morty vs. Dungeons & Dragons (w/ Jim Zubkavich, 4 issues August 2018-January 2019, tpb March 2019, IDW Publishing). ^ "Patrick Rothfuss: Worldbuilder". Locus. August 12, 2010. Retrieved December 13, 2017. ^ Rothfuss, Patrick (May 8, 2008). "Your College Survival Guide: The End". The Pointer. University of Wisconsin–Stevens Point. Retrieved June 12, 2009. ^ Rothfuss, Patrick (2007). "Bio". Patrick Rothfuss official website. Retrieved September 1, 2008. ^ a b "2002". Writers of the Future Contest Winners. Author Services, Inc. 2007. Archived from the original on September 9, 2007. Retrieved September 2, 2008. ^ "World Fantasy Awards 2015". sfadb.com. 8 November 2015. Retrieved 2 March 2016. ^ "Worldbuilders: Our Story - History". Retrieved December 29, 2017. ^ "Worldbuilders: Geeks Doing Good". Retrieved January 5, 2018. ^ "YouTube". www.youtube.com. Retrieved January 3, 2019. ^ "Critical Role: Episode 56 - Hope". Geek and Sundry. Retrieved 27 September 2016. ^ "Critical Role: Episode 69 - Passed Through Fire". Geek and Sundry. Retrieved 30 September 2016. ^ Geek & Sundry. "Lords of Waterdeep: Felicia Day, Pat Rothfuss, and Brandon Laatsch Join Wil on TableTop SE2E10". Retrieved January 3, 2019 – via YouTube. ^ "Why I Love My Editor…". Blog.patrickrothfuss.com. July 9, 2012. Retrieved August 6, 2013. "On Being Manly". Blog.patrickrothfuss.com. July 5, 2012. Retrieved August 6, 2013. "Following up, Moving on, and the Cuteness of Cutie". Blog.patrickrothfuss.com. February 11, 2014. Retrieved February 26, 2013. ^ "UWSP lecturer honored at 2007 Quill Awards" (Press release). University of Wisconsin–Stevens Point. October 26, 2007. Archived from the original on August 24, 2007. Retrieved September 2, 2008. ^ "PW's Best Books of the Year". Publishers Weekly. November 5, 2007. Archived from the original on May 12, 2008. Retrieved June 7, 2009. ^ "RT Award Nominees & Winners". RT Book Reviews. Retrieved August 6, 2013. ^ "Your Picks: Top 100 Science-Fiction, Fantasy Books". npr.org. August 11, 2011. Retrieved August 6, 2013. ^ DeNardo, John (June 17, 2012). "Winners: 2012 David Gemmell Award." SFSignal.com. Retrieved 2012-10-12. ^ (2012-06-15) "David Gemmell Legend Award Winners 2012 Announced Archived September 21, 2013, at the Wayback Machine." GemmellAward.com. Retrieved October 12, 2012. ^ "Locus Announces Winners of "Best Novels of 20th and 21st Century" Poll". Tor.com. December 22, 2012. Retrieved August 6, 2013.